Southerners don’t need to drive or commute all the way to Makati's Little Tokyo to taste authentic Japanese cuisine. 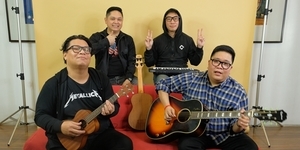 For the same price at a nearer location, BF and Alabang residents can enjoy the treats from the Land of the Rising Sun in the Hanakazu Japanese Restaurant. Hankazu is a refreshing break from the fast food type Japanese restaurants found all over the metro. Japanese food connoisseurs and avid food lovers will enjoy this restaurant’s freshly prepared dishes. 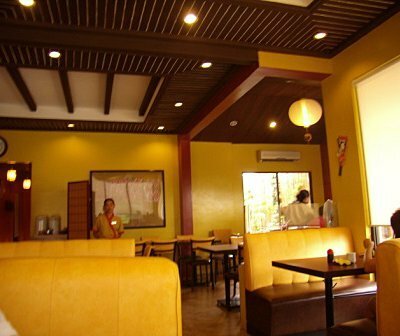 Similar to Japanese owned establishments in Makati, the staff greets you in Japanese. The restaurant’s authenticity was more emphasized by the chopsticks and wet towels given as soon as we sat on our table. No signs of spoon and forks unless they’re requested. The food choices presented in the menu were plentiful, unlike other Japanese restaurants that only serve fried beef, pork, squid or sushi dishes. First on our taste list were the raw fish choices: the Toro Salmon (P590) and Ebi Ten Maki (P280). 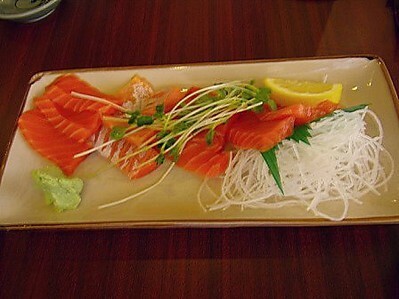 According to the waitress, the salmon came from Japan! Though the fish came all the way from another country, it tasted very fresh—so fresh it was a calming experience. The salmon did not taste old or fishy at all. If I hadn’t been with my mom and sister, I’d have finished the whole plate. The heavier appetizer was the Ebi Ten Maki, beautifully presented with parsley sprinkled all over the sushi pieces. 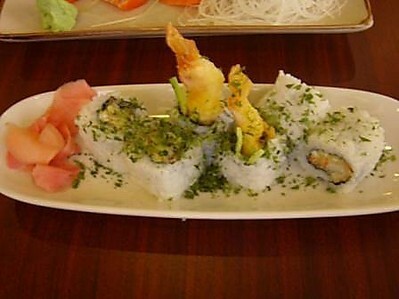 Two of the sushi pieces had the tempura's shrimp tail sticking out. The waitress also informed me that this maki was a popular favorite among their visitors. With just one glomp, we experienced a surreal taste explosion. My mom commented that the maki was gifted with so many flavors that it didn't need soy sauce. 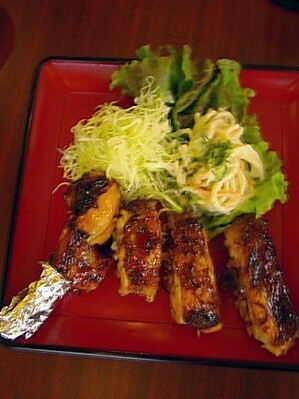 For our main course, we ordered Tori Momo or teriyaki chicken (P250). The chicken came with a Japanese salad made of cabbage strips, lettuce, and mayonnaise-covered spaghetti. It may sound disgusting but it's actually a savory yet healthy combination. If you’re averse to green salads, this Japanese variation may just be the one to suit your taste. The spaghetti didn't taste fatty and disgusting like other mayonnaise based dishes. The chicken was equally delightful and satisfying. Each meat piece was lightly covered in the teriyaki sauce, finding the right balance between sweet and savory. We partnered the Tori Momo with one order of Yakimeshi rice (P180). 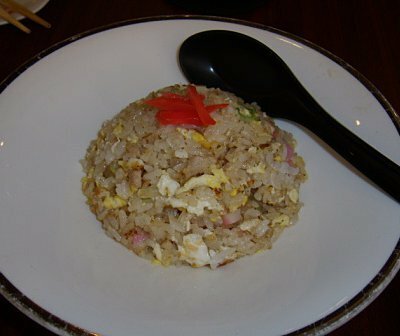 The Yakimeshi rice was a perfect partner for the chicken, adding more satisfaction with its pork, squid, egg, and spring onion bits. Although the quantity was little, it was just enough to split among me, my sister, and my mom. I wouldn’t recommend ordering just one plate of this rice for a group of guys. As for visitors hoping to taste as many dishes as possible, one plate is just enough. After feasting on rice and meat, we moved on to the Mix Tempura (P390) and Cha Soba (P230). The Mix Tempura included breaded shrimp, vegetable variations, fish, and eggplant. Standing out among the breaded pieces was the shiitake mushroom tempura. 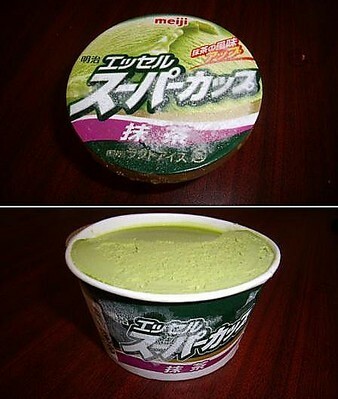 It was a unique variation and the tastiest among all the choices. 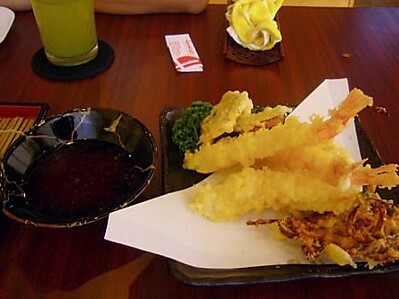 Hanakazu even managed to impress with a dish as simple as tempura. The breading was wrapped perfectly around seafood and vegetables. The shrimp portions weren’t too big and were easy to feed into our mouths. The cooking wasn’t too oily but the tempura still gave that familiar crunchy and savory taste every Filipino is after. Another simple dish they executed with perfection: the Cha Soba. This cold noodle variation is appropriate for the unbearable heat we’re all suffering from this summer. Unlike other Japanese restaurants, their noodles stayed cold without having ice placed around it. The Cha Soba was an appropriate main course “finale,” a light dish only needing to be dipped into a sauce with spring onion and wasabi for flavor. 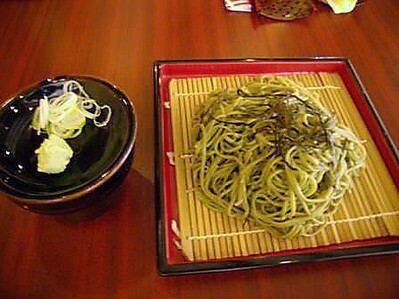 If you need more protein with the soba serving, try having the noodles with one of the tempura pieces. Hanakazu impressed us all the way with its professionally prepared and creatively presented dishes. Expect to spend a costly price; our bill reached P2,275 (with service charge) for everything. But anyone who’s eaten in authentic Japanese restaurants knows the high cost is worth paying. Lunch or dinner here only means having the freshest ingredients, so save more room in your taste buds rather than squeezing in as much food into your stomach. Although the servings are small, the flavors they offer are more than enough to satisfy the hungry palate. You don’t need to go far to experience a bite of Japan. BF residents can just take a tricycle or drive along Aguirre Avenue. Visitors coming from Alabang can access Aguirre from Concha Cruz, coming from Alabang Zapote Road.